As of the writing of this post, prediction markets have Trump's chances of winning the Republican nomination for President at 70%, a decline of about 10% in just the past few days. Most likely the softening of Trump's numbers have to do with a series of news cycles exposing his long history of brazen, outrageous sexism and linking it to Trump's miserable unfavorables among women. Astonishing... it's almost as if women pay attention to how candidates talk about gender. Just how bad has it gotten this week for Trump? His campaign manager was arrested on charges of battery after he forcibly grabbed a female reporter at a press conference. He engaged in a despicable sleaze-fest on social media with Ted Cruz about the comparative attractiveness of their wives and the mental health of Heidi Cruz. Then just yesterday Trump suggested that "there has to be some form of punishment" for women who receive illegal abortions, until, that is, withering criticism of this deeply unpopular opinion forced Trump to walk back the statement a few hours later. The cumulative effect of these stories and others may be playing out both nationally and in crucial primary states. If Trump's numbers can't hold up in the 17 remaining primaries, the chances of his securing 1,237 delegates and the nomination outright become increasingly slender. That means the contested convention scenario every pundit has been feverishly contemplating might in fact come to pass. And the most likely scenario is one in which Trump enters the convention with a clear plurality of delegates, a fiercely loyal core of disaffected white male working class Republican support, and declining national momentum, as the long odds of a Trump win in November are broadcast with greater and greater clarity while desperate #nevertrump-ers cast their votes for Cruz or Kasich. That seems like a recipe for chaos. There is now no possibility that the Republican Party will survive its rendezvous with Donald Trump unbroken. If Douthat is right—and I think he is—the critical question for the 2016 election is not who wins the White House, but in the longer term how will the Republican Party repair itself? Conservative politicians, operatives, intellectuals, pundits, and indeed delegates ought to proceed with that question foremost in mind. That isn't easy for a political establishment trained to single-mindedly pursue electoral victories. Moreover, if Trump is to lose, the lesson (assuming there is any) about his popularity would be best learned if he loses straight up. Abandoning the party and running a rear guard action would enable Trump supporters – assuming he loses – to operate under a “stabbed in the back” theory in 2020 and going forward. And they’d be right! Sure, this strategy might make 2020 and 2024 more difficult, but Trende's "assuming he loses" interjection reveals the fallacy here. If Trump is the only GOP candidate he might win, and that would endanger the republic. The reason for conservatives to run someone against Trump is to ensure that he loses, because the moral imperative of keeping a pugnacious, ignorant, hyper-confident, alpha-male, fascist out of the Oval Office (and more importantly out of the White House Situation Room) not only outweighs the significance of any particular presidential election, but provides the best opportunity of establishing a new dialogue among conservative voters about the kind of party they want to have in the 21st century. UPDATE: Friday at 12:30pm, Predictwise has Trump down to 61% and Cruz up to 22%. It's a cold, rain-soaked day in Massachusetts, the kind that give rise to a "damp, drizzly November" in the soul. Except it's March. That kind of day requires the right musical prescription, something gritty, swinging, and with enough gospel to fend off the blues. 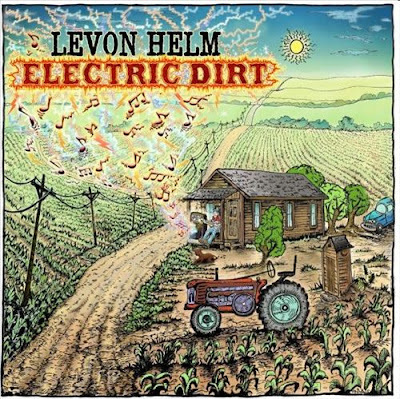 Best advice: the late great Levon Helm's 2009 album Electric Dirt. Helm's voice is in pretty great shape here, though (after throat cancer) not quite what it once was in his heyday with The Band. His own composition, "Growin' Trade," sounds like vintage Band material. But it's some of the covers that are really extraordinary, especially "Heaven's Pearls," written by his daughter's band, Ollabelle, and "When I Go Away," a rockin' gospel tune written by longtime Dylan guitarist Larry Campbell. I can’t believe that n[****]r won this election. He hasn’t done anything in the 4 years prior and I don’t feel that he’s going to do anything in the 4 years upcoming. I don’t think I can serve in the military another 4 years under his control. I might have to go back home in this upcoming training session that we’re going to do for the winter and break out my KKK robe that was handed down to me by my grandfather and go put one order up and make it my last order to kill the President. According to the opinion of the court, "Ultimately, the inquiry uncovered no evidence that Appellant or his family had any connection to the Ku Klux Klan." It’s been five days since President Obama won a second term with comfortable if not commanding margins in the electoral college and the popular vote (now 3+ million and still counting in a few areas). The universe of pundits seems to have arrived at a consensus that the Republican Party has a serious demographic problem. (That Romney lost after winning 60% of the white vote probably tipped them off.) Nor does it appear to be easily or swiftly solvable. It would be one thing if many non-white Americans didn’t like Republican leaders; it is a substantially more intractable problem that many Republican leaders don’t seem to like non-white Americans. So it’s no surprise that many of the questions being asked run along the lines of: “How will Republicans adapt to this new American electorate?”; “Can Republicans reach Hispanic voters?”; “How can Republicans appeal to more women?” etc. etc. I’m not sure I have the wisest answers, but I am reasonably certain those aren't the right questions. Tactical policy reversals on immigration, gay rights, drug laws, and even tax reform—if they come about—would not provide a long-term solution to the dilemma of right-wing America. If 2012 is to mean anything worthwhile to the future of the Republican Party (and therefore to the future of America), it has to take the form of an ideological reckoning. Taking stock now three years and four months hence, it seems that an ideological reckoning may indeed be at hand for the Republicans. But if so, it will be born of crisis not of conviction. Despite a feint in the direction of self-reflection, the Republican Party has not dared to reconsider its identity in the wake of the 2012 defeat. Its leadership has exhibited neither the courage nor the imagination to do so. Consider that the standard bearers of the party elites, first Jeb Bush, then Marco Rubio, never once in their staggeringly well-funded, magnificently failed campaigns offered an idea to the electorate that wasn't eminently predictable. These were not real candidates; they were Republican presidential derivatives. No, the Republicans find themselves staring into the abyss because of Donald Trump, whom Rubio and Mitt Romney have both called a "con man." They are correct; Trump sells snake oil at every campaign stop. It is a harder truth to realize, however, that Trump's bad medicine is concocted from the same ingredients as the product every other Republican candidate has been pushing for the past four elections, just distilled into something more poisonous. Josh Marshall pointed this out in a post about the inevitable failure of any attempt to run another conservative against Trump should he win the nomination: any conservative they could find basically agrees with Trump on virtually every issue. What could they say to attract voters except, perhaps, that they're not as vulgar? Defeat could help. Not a split between the coasts and the heartland like 2012, but a landslide defeat. At the moment, the polls suggest that is possible. Republicans are looking towards November and the abyss is gazing back.